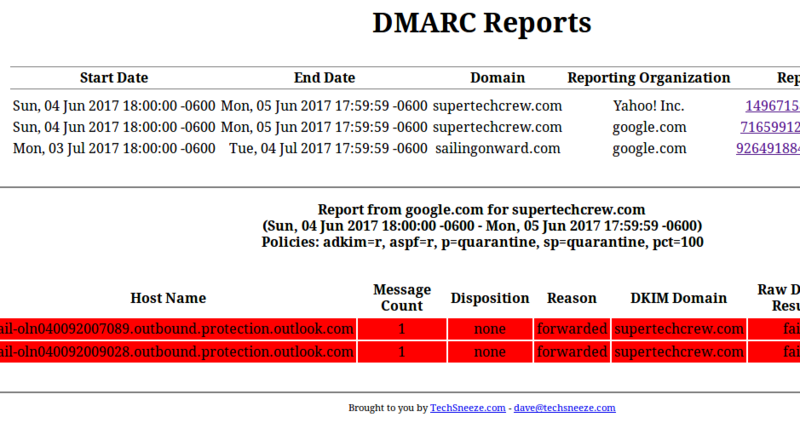 DMARC is a nice mail security setup to protect against forged emails. But even better is how it can actually get participating hosts to send you emails about how your emails are being seen. And if anyone is forging, phishing, or otherwise misusing your domain. 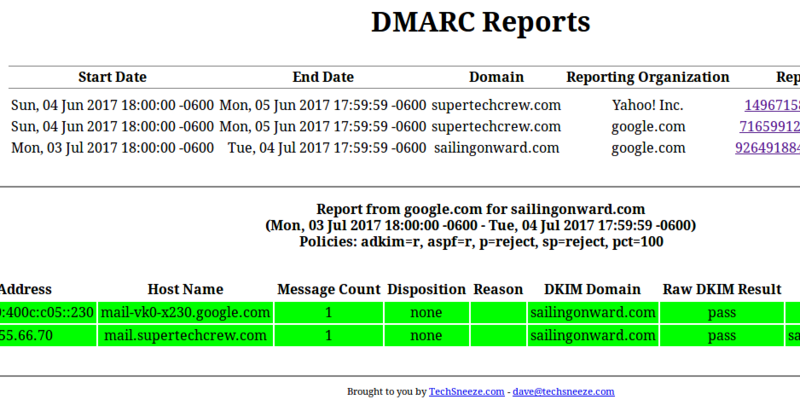 We won’t go into too much detail, but the record uses _dmarc before the domain. The p=none means to only monitor the email traffic. We can change that to quarantine which will suggest to the remote mail server to put email that fails DKIM/SPF checks in the spam folder. Or reject which will instead tell it to reject the message if it fails DKIM and/or SPF tests. Now, the rua is the cool one. This will suggest to the mail server that it sends the specified email a report to the given email about emails that it gets, and as to whether they passes or failed, and why. Some dns providers may not like the \;. Just use ; and you should be ok.
To help you create it, you can use the DMARC Creator and Inspector to help you make it, if you’d like. Once you have it, and have allowed the DNS to propigate, you can check it with various checkers. The previous link also has a checker. Once you setup the above DNS record, you are going to get some emails (usually only up to 1 per day per provider that has recieved emails from you). They will have a zip file of an xml file that contains the data about the email(s) it recieved from your domain. It would be nice to have something to accept these and to parse the information. One such program is dmarcts-report-parser. It will parse the email account where the emails come, and put them neatly into a database. The Readme also tells how to configure the dmarcts-report-parser.conf file, which is fairly straightforward. I opted to just have it use IMAP to get the emails, but you can also just tell it the folder where it’s located, the mbox, or even where the xml files are. So now we have a lot of data in a database. That’s boring and hard to read. Here’s a viewer that can take those reports and show them in an easy to read way (with colors). It needs a webserver like Nginx or Apache, PHP, and access to the mysql/mariadb database where the above script has saved it’s information. Remember to also install the mysql php module. Want to get Forensic reports of the emails that are failing? Such as the emails that are failing, and who is sending them? These emails can’t be used by the above script nor the viewer. They are the full emails so you can see what is being sent, and by who. It’s still really useful! Most every cpu made since 1995 is vulnerable to a set of vulnerabilities that could compromise secret data on computers, servers, and containers.